In this section, you'll learn how to copy the Rust layer and then use the compound shape of the Diesel layer to clip away some of the Rust layer. First, you'll copy the Rust layer and move it above the Diesel layer. 1 Select the Rust layer in the Layers palette and drag it onto the Create a New Layer button (j) at the bottom of the palette. A new layer called "Rust copy" is created directly above the Rust layer in the palette. 2 In the Layers palette, drag Rust copy just above the Diesel layer inside the Words layer set. 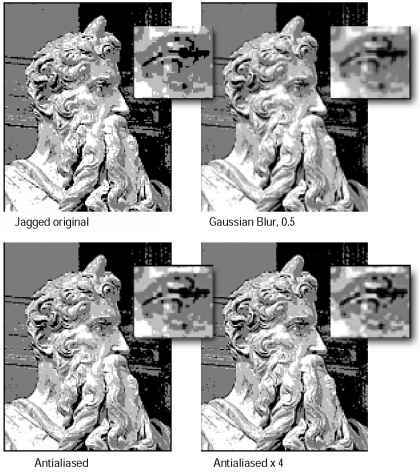 Because Rust copy is the top layer, the rust image is all you can see. 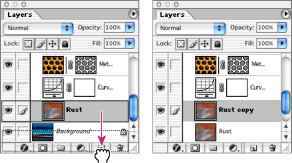 3 Hold down Alt (Windows) or Option (Mac OS) and move the mouse pointer over the line dividing the Rust copy and Diesel layers in the Layers palette. When the pointer changes to two overlapping circles (<g), click the mouse button. The Rust copy layer is clipped away so that it appears inside the Diesel shape and you can see the other layers in the other areas of the image.